The program allows reconstructing complex RAID systems of various complexity, both software and hardware, including standard RAID patterns, nested/hybrid RAID levels as well as custom RAID configurations, and effectively restore data lost due to user errors or various logical issues. Advanced software techniques enable building RAID from physical disks or a set of disk images, editing RAID configurations or saving them for further work. Also, the software features an embedded hexadecimal viewer for brief analysis of data on partitions and disks. Furthermore, the program provides an extensive set of instruments for work with damaged disks: RAID with damaged sectors can be adaptively reconstructed using parity (for RAID 5 and RAID 6), a copy of data (for RAID 1) or disk images with the imitation of bad sectors with help of bad sector maps. In addition to RAID and RAID-based devices, like NAS, the software is applicable for data recovery from other storages: PCs and laptops, USB flash drives, memory cards, external hard drives, virtual machines, disk image files, etc. The software ensures the safety of your data by working in a safe read-only mode while various helpful options like sorting, search filters, file preview, interface-zooming, storage image creator, etc. make the process easy and smooth. Subscription that costs between $15 and $40. Price may vary depending on commitment and so on. 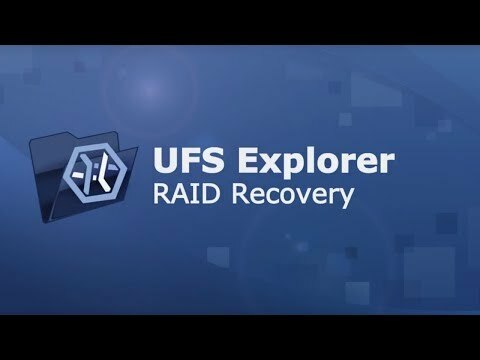 UFS Explorer RAID Recovery was added by msamokhina in Jun 2015 and the latest update was made in Mar 2019. The list of alternatives was updated Feb 2019 There is a history of all activites on UFS Explorer RAID Recovery in our Activity Log. It's possible to update the information on UFS Explorer RAID Recovery or report it as discontinued, duplicated or spam. Alternatives to UFS Explorer RAID Recovery for Windows, Mac, Linux, Software as a Service (SaaS), Web and more. Filter by license to discover only free or Open Source alternatives. This list contains a total of 7 apps similar to UFS Explorer RAID Recovery. No reviews yet for UFS Explorer RAID Recovery, want to be first? Maybe you want to be the first to submit a comment about UFS Explorer RAID Recovery? Just click the button up to your right!